Thursday 8 March was Working and Pastoral day at Crufts 2018. Below is a round up of all the winners and the day’s biggest stories. All the video action from day one can be found at the Crufts YouTube channel. All of our images from the show can be found here. The winner of the Working group was Nana the Newfoundland. Reserve went to the Dobermann; 3rd was the Boxer and 4th was the Alaskan Malamute. You can watch the full group judging here. The winner of the Pastoral group was Roo the Border Collie. Reserve in the group went to the Pembroke Welsh Corgi; 3rd was the Smooth Collie and 4th was the Polish Lowland Sheepdog. You can watch the full group judging here. 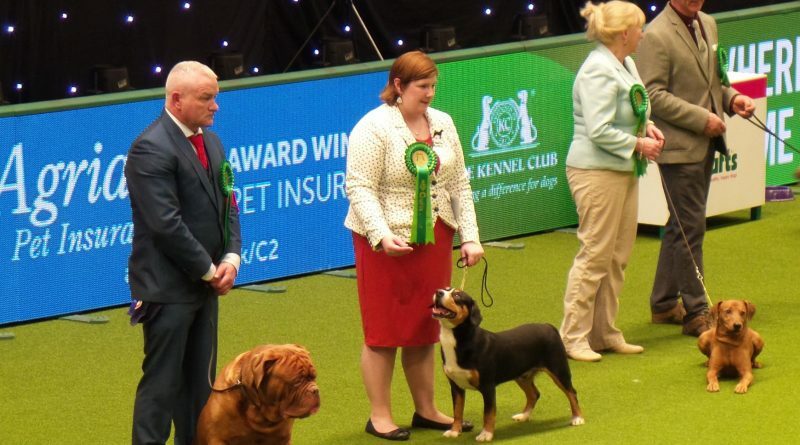 Entlebucher Mountain Dog Buddy (Alfie Bangwood), owned by Sian Baynton, made Crufts history by becoming the first Any Variety Import Register dog to compete in the group. This was after a rule change which came into effect in January 2018. You can watch an interview with Sian here. Daffyd, a Bullmastiff owned and bred by Peter Myers and Deborah Morgan, won the Junior Warrant Winner of the Year competition. The Lively Labs won the Obreedience competition. The Smooth Operators (Smooth Collies) came 2nd, with the Poodle Training Club (Toy Poodles) in 3rd. A full gallery of pictures for this competition can be found here. The five high profile breeds in the Working and Pastoral group all passed their vet checks. Former Eastenders actress Jacqueline Jossa and singer/songwriter and filmmaker Professor Green attended the show. Frontline, a company which specialises in developing products for treating fleas, showcased their giant animatronic dog. They also released new research which shows that 1 in 5 of us would rather share our bed with a pet than a partner. The Barbet, the UK’s newest pedigree dog, paraded in the Good Citizen Dog Scheme ring. You can watch videos of this event here and here. In an interview with the Radio Times, the owner of last year’s Best In Show winner revealed what Miami the Amercian Cocker Spaniel has been up to since his retirement. Meanwhile, the RSPCA sparked a row with Corgi owners after it tweeted that the dogs’ conformation made them​ less able​ to play with other dogs.